A total of 44 new primary school classrooms are to be built in Vienna by the end of 2015. 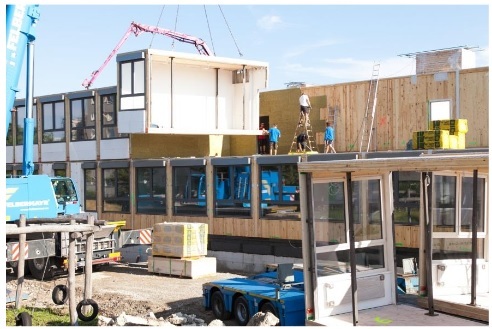 The CLT modules for the first school annex, on Karl-Toldt-Weg in Vienna Penzing, were delivered to Vienna on 7th July. There, the modules were assembled within a very short construction time. "CLT stands for quick and clean construction. The high degree of prefabrication reduces construction time. Dust and noise exposure are reduced and it saves costs", explains Herbert Jöbstl, SVP of Stora Enso Building and Living in Central Europe. At the end of the summer holidays, the new school building should be ready for use so the first Viennese primary school children can take possession of their timber school. As well as creating more space for learning, playing and running riot, the school in Penzing provides another valuable benefit-the healthy climate in timber buildings is proven to have a positive effect on the wellbeing of school children. The Viennese population continues to grow and there is an increasing need for more space in existing primary schools. Therefore, the city of Vienna is now investing in school annexes with modern classrooms and spacious exercise rooms and side rooms. For this project, short construction times and high functionality are of utmost importance and the ecological balance has to be just right for the environmentally-conscious city of Vienna. Therefore, the choice fell to CLT material (Cross Laminated Timber) from Stora Enso. The solid CLT panels are prefabricated in the factory and supplied with precise omissions for building equipment, heaters or windows. Then the panels go to the neighbouring factory of Stugeba Mobile Raumsysteme GmbH, where they are assembled in to finished room modules and shipped to Vienna using special transport. These modules are assembled on site in a short amount of time, the installation also saves time so these buildings can be ready for use in record time. "Our room modules are versatile, they can be combined and assembled in next to no time. This is of great importance for commercial buildings such as e.g. offices, hospitals or schools" Stugeba MD , Jürgen Sturmer, explains the advantages of these methods which will be used to build three more schools in Vienna. CLT also provides a good ecological balance because timber is a renewable resource that stores CO2 long - term. The CLT timber from Stora Enso comes from certified sources. Building security is also an important criterion for school buildings and is fully satisfied when building with CLT modules. CLT has excellent fire protection properties and is distinguished by a particularly high resistance to earthquakes. As well as the technical advantages, the timber construction also has a positive effect on the mood and behaviour of school children. A study by the Human Research Institute from 2009 shows that school children who are taught in timber buildings experience less stress, have less conflicts and concentrate better. Physically, the relaxing effect of timber also shows in a permanently low heart rate. In the study, children from the same school were compared; half of them were taught in a timber classroom. So, for the children in the new school annexes, positive effects on their health and the atmosphere in the classrooms can be expected. Stress is a major problem for children, especially in metropolitan areas, and it can lead to more conflicts and poor concentration. Timber schools can make a significant contribution towards defusing these early strains on children. CLT (Cross Laminated Timber) is a solid wood construction product whi ch is made of at least three layers of single - ply boards, glued together transversely, and is currently produced in a size of up to 2.95 x 16 m. CLT solid wood panels consist of several layers and are available in different panel thicknesses, depending on the static requirements. The lamination is carried out using environmentally-friendly adhesive. CLT offers almost unlimited possibilities regarding design concept, style and architecture and is completely compatible with other construction materials. CLT is suitable for interior and exterior walls, as well as floors and roofs. The finished tailored CLT panels are delivered directly to the construction site, where they are then fitted by a construction company. With an annual capacity of 120,000 cubic metres, Stora Enso is the world's largest producer of CLT.